Now that we’ve turned back the clocks for the winter, my evening dog walk often comes after dark. Safety says I should carry a flashlight, but I don’t want to lug along the big and heavy MagLite that we keep in a closet. That’s why I have my eye on the J5 Tactical V1-PRO Flashlight. 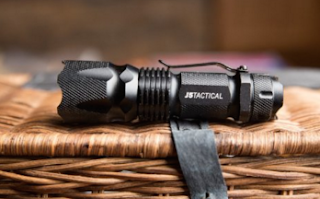 It’s a small and lightweight LED light that can throw out a strong and bright light despite its size. According to the folks at J5, the V1-Pro has an adjustable beam that can sweep light over the length of two football fields on a clear night. It has a high and low intensity setting plus a strobe setting for bike riders. And it runs on a single AA battery. The V1-Pro is available on Amazon for $12.95.